Storage. In a home that the main bathroom is shared, it’s difficult to make it aesthetically pleasing at the same time accommodating to everyone in the home. Medicine cabinets, bath toys, and all the other private hygiene items belonging to everyone cannot be in display. It is always a great idea to install mirrors with hidden storage, shelves and other hanging/storing devices, baskets or other storage items above a lidded toilet seat, among other things to get as much storage as possible for the entire family. Child Approved. When you have small children at home, certain features and items in the bathroom have to be accommodated so you can avoid injury or inconvenience. One great item to have in your bathroom is a thermostatic shower that can keep your child from burning themselves. You can also install temperature regulators in your sinks. There are various options for non-slip surfaces that can be installed in your bath or shower to avoid slips and falls. It is also good to consider showers and tubs with curved edges to ward off nasty bumps and bruises. Tubs. One item that a family bathroom should not go without is a bathtub. While some bathrooms can be small enough as it is, not having a bathtub is less than ideal for a shared bathroom. One way to save on space would be purchasing a corner tub. With children too small to bath themselves, it can be tiresome at bath time when you have the wrong tub. Make sure it is a tub that isn’t very high up so that you’re not struggling to reach your child while bathing them. 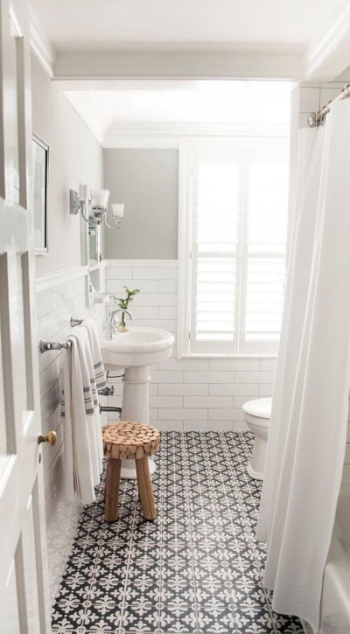 You will also want to consider the comfort of the tile floor to avoid more slips and falls when the child is drying up. Showers. The same rule applies when it comes to showers. You do not want to go without this in a family shared bathroom. The best showers would be those with a single screen. You can also go with a dual bath and shower if you are extremely short on space. However, having both the shower and the tub separate can open up opportunity for multiple people to use the facilities at one time. Sinks. Twin basins are also effective in a family bathroom, and is not just for a master suite. When an entire family is using one bathroom, multiple people can use the sinks at once since there are two to choose from. When it comes to renovating a family bathroom, there are so many things that can go right or wrong. Above all, remember that everything in the bathroom has to be useful. Children should be able to use the facilities with just as much ease as their parents. The environment has to be safe, practical, and spacious with the right amount of storage to keep from overflowing with mess.